Since TVS first unveiled the Draken concept motorcycle at the 2014 Delhi Auto Expo, the internet has been flooded with speculations about the launch of a new 200cc Apache RTR. While TVS has so far been tight-lipped regarding the same, our sources have informed us that the Hosur-based manufacturer is planning to launch the new Apache RTR 200 during the festive season, this year. TVS has so far been successful in keeping the shutterbugs away from Apache RTR 200 test mules and as a result, very few details about this new streetfighter are available. 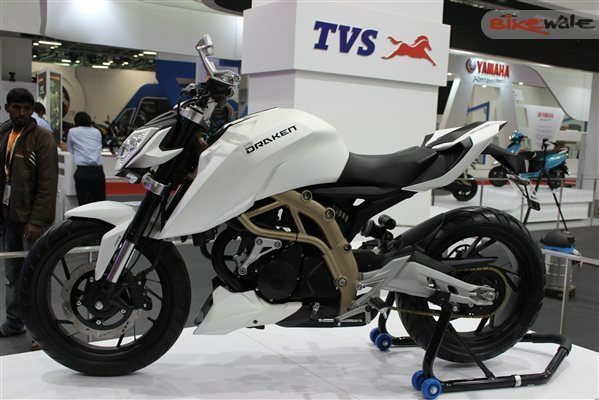 While the overall shape and dimensions of the new Apache RTR 200 might be similar to the Apache RTR 180, the more powerful model might borrow the design cues from the Draken concept. We can expect the Apache 200 to use a rebored version of the Apache RTR 180's engine, putting out around 20bhp. Like the current Apache RTR 180, we can expect the 200cc version to be offered with an optional ABS system. We can expect more details to be revealed as we get closer to the festive season. The Apache RTR 200 will compete with the only other sub-Rs 1 lakh 200cc streetfighter in the Indian market – the Bajaj Pulsar 200NS.